Babies with drug withdrawal symptoms undergo six to eight week of rehabilitation. THERE WERE 92 discharges of newborns from Irish hospitals with drug addiction withdrawal symptoms in 2016. Between 2012 and 2016, a total of 501 discharges from Irish hospitals of newborns with drug addiction withdrawal symptoms due to their mother’s use of drugs during pregnancy were recorded. These figures from the HSE were released to TheJournal.ie under the Freedom of Information Act. Each discharge record represents one episode of care, and babies may have been admitted and discharged from hospitals more than once. The HSE did not provide a breakdown of the drugs the babies were experiencing withdrawals from. However consultant neonatologist at the National Maternity Hospital, Dr John Murphy told TheJournal.ie that most cases presented to the National Maternity Hospital are that of methadone addiction. Withdrawal symptoms of heroin and cocaine are also common among these babies. “Cocaine is a real worry. It can cause spasms of blood vessels in babies’ brains,” Murphy said. Over the past five years, 2013 saw the highest number of discharges of newborns with drug addiction withdrawal symptoms. There are no figures available for 2017 yet. Murphy told TheJournal.ie that babies who experience drug withdrawal tend to be irritable and unsettled. “They’re not like normal babies who cry, where you feed them and they settle. They’re difficult to calm down. They’re very hungry but they don’t feed well because a lot of their muscles are uncoordinated. Other symptoms can include tremors, sleep problems, crying, hyperactive reflexes, seizures and sneezing. Babies who are born with drug withdrawal symptoms are admitted into intensive care for a six to eight week recovery programme, according to Murphy. The babies who experience excessively high levels of withdrawal are given morphine for a number of weeks in the intensive care. “We have scorecards we keep every day to track the [baby's] symptoms, the amount of crying they do, and so forth. We can score them and if it’s seen to be excessively high we treat the babies with a small amount of morphine. “It’s a slow process. It can take up to six to eight weeks but gradually they’ll regulate and they’ll settle,” he said. As the baby’s symptoms begin to regulate and lessen, they are gradually taken off the morphine medication. The figures reveal that almost half of all discharges were in Dublin. 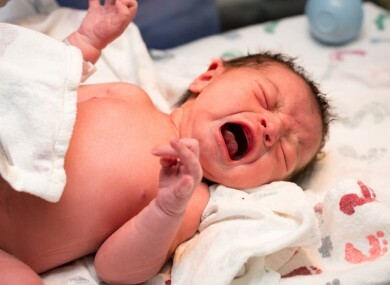 44 discharges of newborns with drug withdrawal symptoms were from Dublin maternity hospitals – The Coombe, the National Maternity Hospital and the Rotunda – in 2016. Meanwhile, 48 of such discharges were made in other Irish maternity hospitals in 2016. Since 2012, a total of 286 discharges of newborns with drug withdrawal symptoms were from maternity hospitals in Dublin. There were a total of 215 discharges from Ireland’s other hospitals. TheJournal.ie asked Murphy about the discharge process for babies who have experienced drug withdrawal. In almost every case, they are sent back to live with their birth families. All of these babies will go into families where there is experience of drug taking. That’s not the case in most countries but in Ireland, yes. Murphy explained that when a woman with a drug addiction becomes pregnant, they are usually enrolled onto a methadone recovery programme. “Most of the time, the mums will be on a good methadone programme, so hopefully they’ll be controlled in that way,” Murphy said. The HSE was unable to provide details of the cost of care for babies with drug addiction issues. Email “92 hospital discharges of newborns with drug withdrawal symptoms last year”. Feedback on “92 hospital discharges of newborns with drug withdrawal symptoms last year”.